Guide on Other Income from the perspective of Income Tax covering income by way of winnings from lotteries, crossword puzzles, races including horse races, card games, gambling or betting of any form. 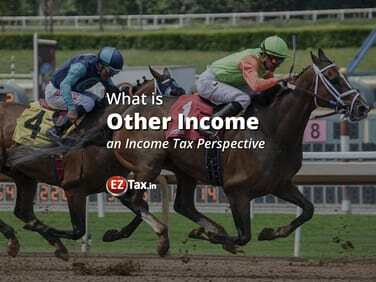 Income chargeable to tax under the head 'Income from Other Sources' in the perspective of Income Tax Act is covered in detail. What would be considered as Other Income? Dividend received from domestic company shall be exempt from tax. It is chargeable to dividend distribution tax in the case of resident individual/HUF/firm; dividend shall be chargeable to tax at the rate of 10%, if aggregate amount of dividend received during the year exceeds Rs. 10,00,000. Any sum received by an employer from his employees as contribution towards PF/ESI/ Superannuation Fund etc. If same is not deposited in the relevant fund and it is not taxable under the head 'Profits and Gains from Business or Profession'. If any sum is received without consideration in excess of Rs. 50,000 during the previous year, the whole amount shall be chargeable to tax. If an immovable property is received without consideration and the stamp duty value exceeds Rs. 50,000, the stamp duty value of such property shall be chargeable to tax. The amount equal to 5% of consideration. If movable properties are received for consideration which is less than the aggregate fair market value of properties by an amount exceeding Rs. 50,000, the difference between the aggregate fair market value and the consideration is chargeable to tax. If shares in a closely held company are received by a firm or another closely held company from any person without consideration or for inadequate consideration, the aggregate fair market value of such shares as reduced by the consideration paid, if any, shall be chargeable to tax. Note: Nothing would be chargeable to tax if taxable amount doesn’t exceed Rs. 50,000. If a closely held public company receives any consideration for issue of shares which exceed the fair market value of such shares, the aggregate consideration received for such shares as reduced by its fair market value shall be chargeable to tax. Where the consideration for issue of shares is received by a venture capital undertaking from a venture capital company or venture capital fund. Where the consideration for issue of shares is received by company from class or classes of person as notified by the Government. Any compensation received by a person in connection with the termination of his employment or modification of terms and conditions relating thereto. Interest received on compensation or enhanced compensation. Any sum of money received as an advance or otherwise in the course of negotiations for transfer of a capital asset shall be charged to tax.